One projector should be designated as the sharp projection. One projector should be designated as the unfocussed projection. Both projectors begin as unfocussed. Figure enters and both videos of tree in backyard are projected on black curtain. Video image is not recognizable at this point. 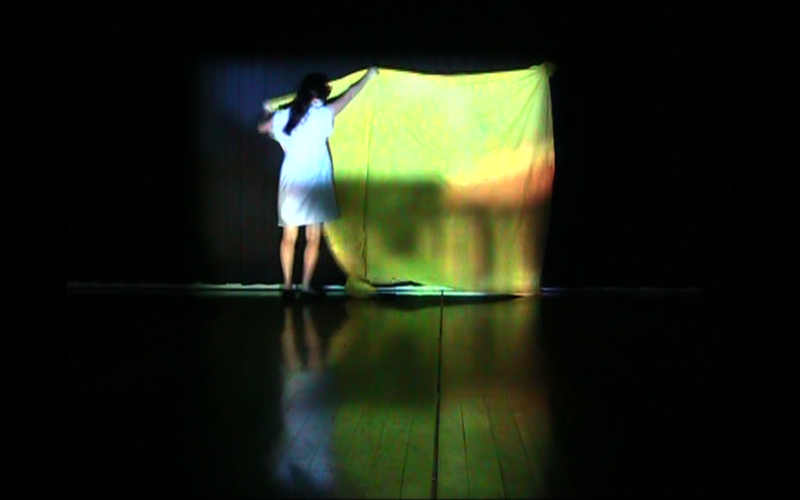 Figure brings in a yellow sheet of cloth and pegs it on the curtain, beginning from top corner. Figure attempts to peg other top corner as well, making sheet as taut as possible to catch video projection. Projection is a little more visible. As pegs do not clip too well, it would fall off if pulled a little tightly, and sheet should be pegged up again. Figure walks out of space to bring in a roll of astroturf. Figure lays it out directly parallel to hung sheet. Figure goes to laptop and increases volume so that sounds of backyard are obvious. Figure approaches data projector and adjusts focus of the designated sharp projector. As image sharpens, the tree becomes more obvious. Figure might re-adjust peg so that sheet becomes more taut. Figure pulls in a standing lamp from stage-right, turns it on. Figure leaves space again, and brings in a red-checkered picnic blanket. Figure leaves space to retrieve a book and walks back in, placing it on the picnic blanket. Figure returns to lamp to position it carefully so that it shines onto astroturf patch. Figure steps onto picnic blanket and kneels, pulling in book. Figure flips book open, and lies down her stomach and reads silently. Figure continues reading silently and does this for some time. To experiment with the qualities of a video projection and the potentials of double projections. To experiment with personal objects and the creation of a comfortable place. To extend a process into a performance. To work with artificial elements, often with sensorial impact. Through giving attention to sensorial receptivity by manipulating the focusing function of a data projector, using a yellow sheet to catch the projection, utilizing a standing lamp to represent light, including astroturf to represent grass, laying out the picnic blanket for comfort, and playing the recorded sounds from the backyard with the video – wind, birds chirping, traffic noises etc. Suspending the moment of revelation seems to be the direction taken. The waiting audience can be rewarded. At this point, a small reward is that of sound.